Designed for cutting tight corners, curves, and circles on cloth, paper, vinyl film and leather. After product testing with quilting, sewing and craft instructors, this cutter scored an A+. Designed by OLFA for use in intricate and detailed cutting, this cutter is one-of-a-kind. Perfect for curved piece quilting, appliqué, trimming seams, template cutting, scrap booking and miniature quilting. 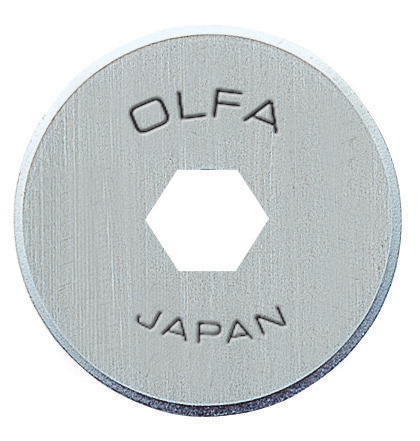 Also accommodates OLFA's 18mm perforation blade for template cutting, ticket-making and scrapbook designs. Easy blade change for safety and efficiency. Perfect for use in travel. Easily accommodates both right and left-handed users. Guaranteed Forever. Uses Replacement Blade RB18.